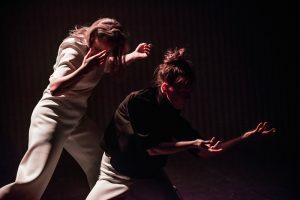 Collapsing Distance synthesizes a number of themes which have permeated Siri & Snelle’s productions since their founding in 1992. Feminine aggression and forbidden feelings explored earlier (e.g. The Closet, 2013, and Grums, 2014) will be revisited through a collective investigation with other artists. Skrevet 18. August 2017 av Siri & Snelle. Skrevet 26. September 2016 av Siri & Snelle. I am Cosmos will perform at Tid for Dans festivalen hos dans i Grenland, Porsgrunn, Norway. Skrevet 14. June 2016 av Siri & Snelle. 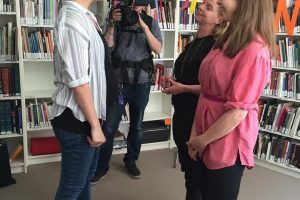 Today we were interviewed at Danseinformasjonen in Oslo by Anne Kathrine Fallmyr from NRK Kultur / Hovedcenen (Norwegian TV) on the occasion of our 25th anniversary. Skrevet 13. June 2016 av Siri & Snelle. Koreograferer for Balletthøgskolens vårforestilling, 1.a klasse! Skrevet 25. April 2016 av Siri & Snelle.